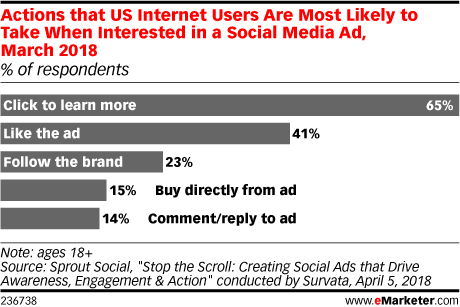 Data is from the April 2018 Sprout Social report titled "Stop the Scroll: Creating Social Ads that Drive Awareness, Engagement & Action" conducted by Survata. 1,004 US internet users ages 18+ were surveyed online during March 5-6, 2018. Respondents were reached across the Survata publisher network, where they take a survey to unlock premium content, like articles and ebooks. Respondents received no cash compensation for their participation.